We have been seeing unusual things recently, and a surprising number of them are green at least part of the time. This is quite shocking, as we had grown accustomed to unrelieved shades of white and gray. One morning I found a large insect hiding out on the side of the house. She was about two and a half inches long, which is a pretty good size bug in my experience, and her translucent wings had a decided green cast. I captured her in a peanut butter jar and brought her into the house to measure and identify. 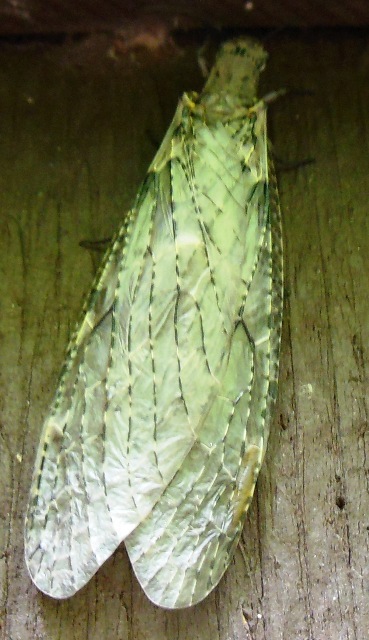 She turned out to be a female Dobsonfly, a very large variety of fishfly. Indoors she was clearly brown – and clearly annoyed with me. She managed to get away and I have no idea where she went. Fortunately, adult dobsonflies have a life expectancy of about a week, not even taking into account curious spaniels, so that’s all right then . . . unless she deposited eggs in the Cowboy’s water dish. If we end up raising hellgrammites in the dog room, people who fish for bass will be beating a muddy path to our door and we will become the Writing Studio and Bait Shop in earnest. Huh. Who knew? Well, OK, Stan did, and now we know too. The thing is, it grows everywhere Around Here in the early summer, and . . . it’s pretty. The parts that look like petals are really bracts, just like poinsettias; the flower itself is that tiny little part in the center. Miss Sadie, the Cowboy and I will probably bring it home again but we promise not to put it in the salad. 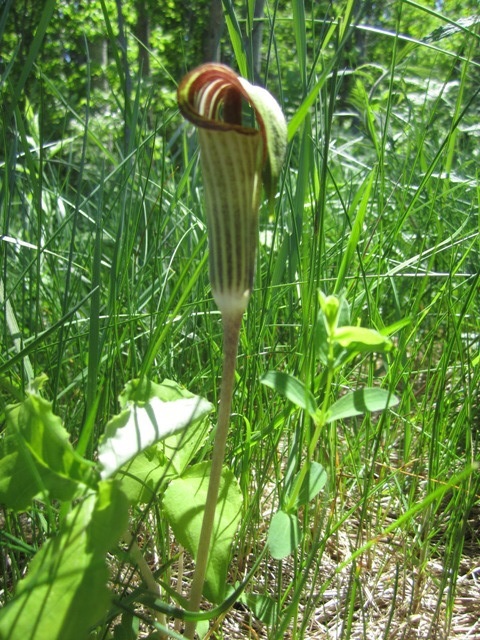 During that same walk a single Jack-in-the-Pulpit appeared at the edge of the meadow. Just one. This could suggest that Jack is a prophet crying in the wilderness. There’s a lot of that going around. 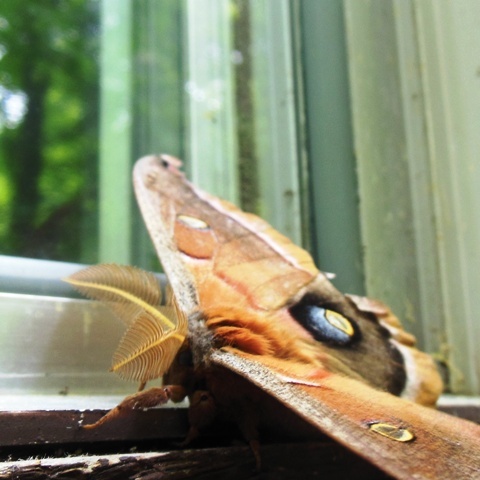 Bedazzled by all the green, we found it a nice change to wake up to a Polyphemus moth on the window ledge. He was a bit the worse for wear, but still very handsome. He’s named after the Cyclops blinded by Odysseus, which seems unfair to the moth. After all, he has four eyespots, not just one, and he’s an inoffensive and intricate creature. Apparently those very full (“plumose” – isn’t that a nice word?) antennae are the key to tracking the pheromones of female moths. As a side benefit, he probably gets very good cellphone reception. I was fascinated by how downright furry he looked up close, and by the transparent tissue that makes up the center of each eyespot. It looks like glassine, or old-fashioned isinglass. I leave you with one last vision of our northern woods. Bruce Bigelow has been removing dead and dying trees in the neighborhood because (1) they have been threatening to fall down on our valuable persons and (2) they are potentially good firewood and after last winter firewood is much on everyone’s mind. The roots are left to keep all our Critical Dunes (aka sandy hills) from sliding into the Bay. 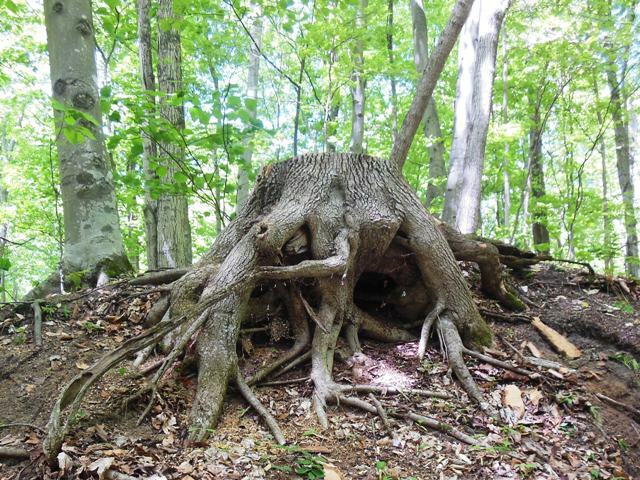 As a result, one of my favorite Hoo-doo Trees has devolved from a woodpecker condo complex to a Stump Creature. I believe he goes BOO in the night. You will be glad to know that no baby woodpeckers were harmed in the making of this Stump Creature. As for the firewood trees . . . them as cuts ’em down gets the wood. There are some firewood trees on my “estate,” Let me know if you want to take ’em away! Thanks so much. Beautiful pics – as always!!! Thank you – as always. Oh, gosh. There they are. Such fun to see the creatures in their entirety. 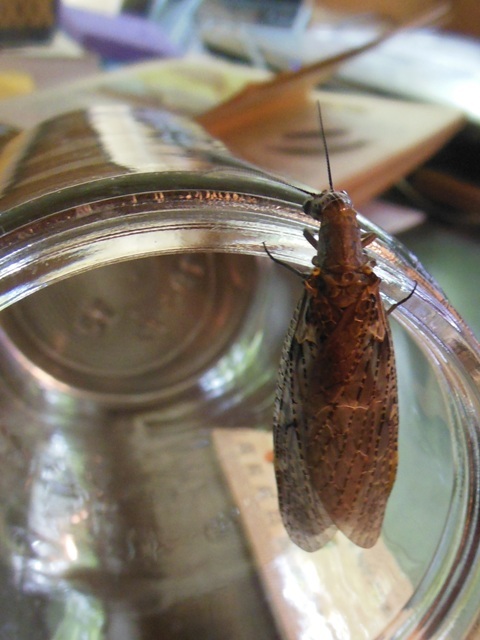 I did read a bit about that dobsonfly, and, as so often happens, it looks like the female’s the one to worry about. What really stopped me was seeing that they prey on bullfrogs, among other things. Bullfrogs? Reminds me of Annie Dillard’s tale of the water bug dining on a frog. I’ll spare you the details, except to say that, after dinner, there was nothing left of the frog but the skin. I’d forgotten about glassine. I believe the little envelopes my dad used to keep his stamps in were made of that. And what fun to see a jack-in-the-pulpit. We had those, combined with lily of the valley, in our front yard when I was a kid. I didn’t realize it grows in Texas as a native, but east of me. I’ll have to keep my eye out for it if I go across the Bay. The singular image I retain from Pilgrim at Tinker Creek is that frog, deflating in front of Annie’s eyes. Life is earnest. Life is real. I think the eyespots are like glassine – but I’m not completely satisfied with that simile. They are so thin, so crinkly – and yet they must be so strong to remain intact after those large wings are, themselves, beginning to tatter. 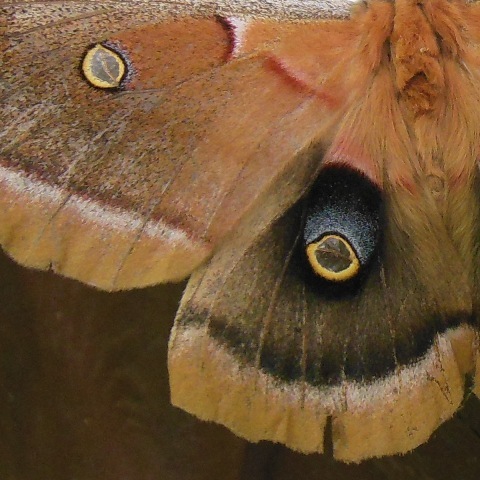 The intricate design of the Polyphemus moth is one of Mama Nature’s better efforts I think. I was just tickled to see even one Jack-in-the-pulpit. I’d love to find an entire patch of them. As for lilies of the valley, I love them and had them in my garden in Detroit for a very long time. They smell far better than the Cowboy and Miss Sadie – if not quite as fine as arbutus. The polypehmus moth pictures were a delight. I am very glad to know that you liked them. The polyphemus moth itself enchanted me. I love your take on nature and the way you describe and learn about the things you find. Hopefully Miss Sadie and the Cowboy don’t decide to take any sample bites from the leafy spurge. 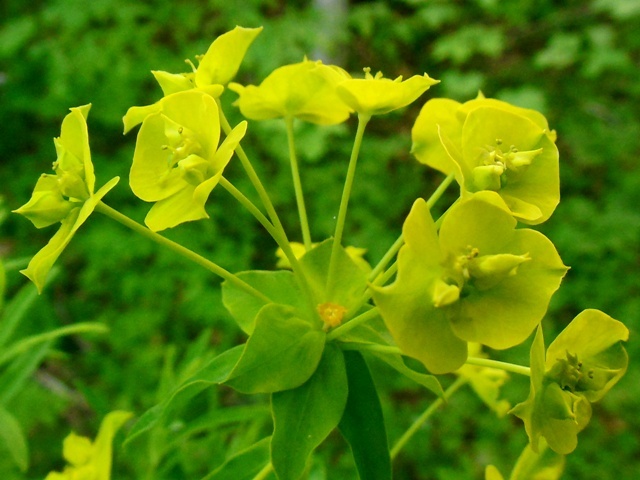 Leafy spurge would probably be an improvement over some of the things they think are good to eat. We won’t get into that discussion this morning. Gerry, those moth photos are stellar. (You inspire me to reach for different words.) I’m glad you’re still bringing things home from your walks, too. Why should we ever grow up all the way and leave that behind? Thank you PJ. I really liked the moth. Best of all, he sat quietly on the windowsill while I took pictures. Nobody else does that. Amazing shots. And you are right. No one really does sit quietly on the windowsill these days. Thank you. I might try it myself – just sitting quietly on the windowsill for an hour or so. It seems restful. Polyphemus is a stunner, no mistake, I’m sure he is much better looking than his namesake. I only heard that euphorbia is poisonous yesterday, by coincidence. I have loads of it in my garden, all planted by me not realising it was both a noxious and a European weed! Haha! We’re gunning for Himalayan balsam here, which is an Asian weed, but not a noxious one. I am pretty sure that a weed by any other name is an attractive stray that washed up on the beach and took root. Not unlike the Cowboy. 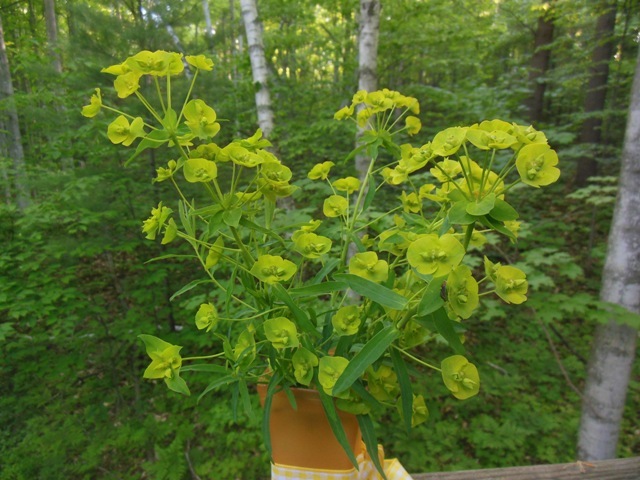 I’ve decided to enjoy the leafy spurge for its beauty and keep in mind that it has other less desirable qualities . . . So many interesting things, so many stories to this post. Euphorbia, can be a nasty irritant, as I know to my cost (having made a bouquet for a princess). Moths and pheromones, I read once of a volunteer helping with precious textiles in a historic house here in the UK, As they unfolded the fabric, out came masses of moths, they panicked and ran through the house with the offending fabric, spreading moths and lave as they went. They had to use pheromones to catch the little blighters from the rest of the house. Long live the ‘nature table’ long live sitting on windowsills. You gave a princess a rash?!?!?!? You dickens, you. Ah well. If hellgrammites grow in the Cowboy’s water dish I will have to go sit on the windowsill for a long time. Did I ever tell you about the time I picked up the phone and found Annie Dillard on the other end? I used to employ that deflated frog as part of a classroom writing exercise (A.D.’s description, not the actual frog). Loved going along on your virtual walk. It is always a pleasure to walk with you. Just remember – please do not pat the leafy spurge. I am not at all surprised that you found Annie Dillard dangling from the other end of your phone. Your phones have been employed to worse uses. If she ever dangles by again, please convey my compliments in memory of the frog. That furry cyclops is a marvel to behold. The closest I’ve seen to such a wonder is a lunar moth which my son found one evening years ago. Apparently don’t eat a nibble at the adult stage and that makes me think they’re probably fairly short-lived. Such beautiful creatures.